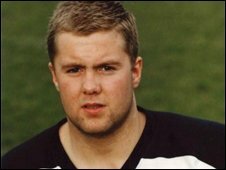 Former rugby league player David Myers has been killed in an accident on the M6 in Cheshire. The ex-Great Britain and Widnes star died when his van hit a bridge support on Monday between junctions 17 and 18. The 37-year-old winger, from Warrington, scored a match-winning try when playing for Wigan in the 1991 Challenge Cup Final. Myers died about 90 minutes before a separate crash on the M6 in which a family of six died. Pat Clusky from the Widnes Vikings said everyone at the club was shocked by the news of Myers' death. He said: "He was probably about 15, 16 when he made his debut for the club and obviously went on from Widnes to Wigan to Bradford, Salford - he went to Australia as well. "But I think most Widnes fans remember him for his part in the '93 team that got to the Challenge Cup final, especially the semi final against Leeds over at Central Park where Widnes put forty points on Leeds that day and it was a great team performance." A spokesman for Wigan Warriors said: "It is with regret that the Wigan Warriors have today learned of the sad death of former player David Myers in a car accident. "Myers played for the Club between 1990 and 1992 where he made 69 appearances for the team scoring 38 tries. "The winger will be remembered particularly for the 1991 Challenge Cup Final where he scored a vital try at Wembley to help Wigan defeat St Helens, 13-8." Wigan performance director Joe Lydon said: "David and I played in the same Wigan team in the early 1990s. "It is such a tragedy to learn about this news and my thoughts are with his family."